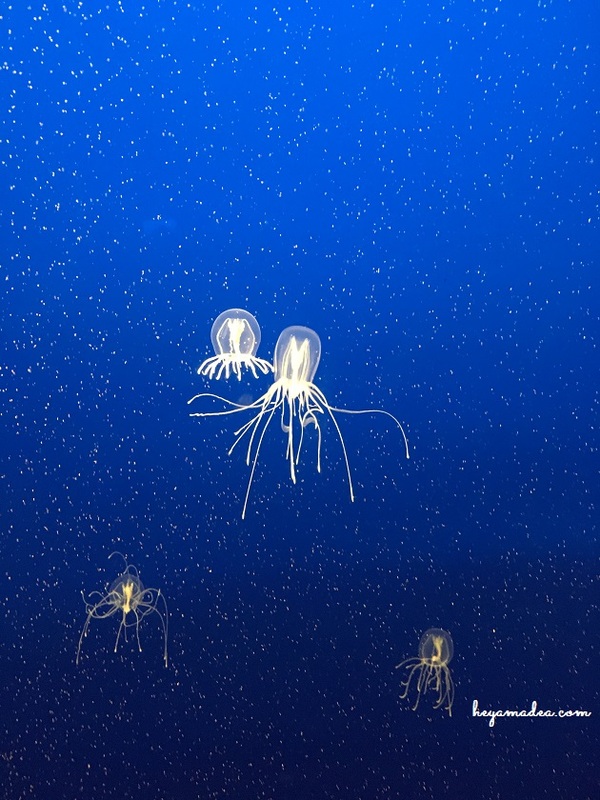 Two weeks before my working Saturdays start, my husband took me to the Monterey Bay Aquarium. We've heard that it's the largest aquarium, and it's also the inspiration of the Marine Life Institute in Finding Dori! I am always fascinated everytime I go to aquariums. We have visited different aquariums in different cities, and nature always amazes me. Monterey is about 1.5 hour drive from where we live, so it wasn't that bad. We even planned ahead and brought our own lunch because we just wanted to spend the whole day in the aquarium, since the entrance ticket is a bit pricey - $49.95 for one adult. The view from inside the aquarium is just amazing. They have this giant floor-to-ceiling ocean exhibit, just like the one you see on Finding Dori. You can see a lot of different fish and non-fish animals inside, and it's just mesmerizing. I am kicking myself for not bringing my good camera, but really. I could just stand and watch the fish swim for hours, which technically what exactly we did for that Saturday. We watched the sardines swim in sync and it's just so mesmerizing. I had been shopping at Old Navy for several times, and I feel like Old Navy always offers good selections from practical to stylish items at affordable prices. I never shop at Old Navy without coupon, and I feel that it's a waste to pay full price at Old Navy because they always go on sale! I was looking a fuss-free, carefree, light-weight bag that I can just hang on my shoulder and be out and about. I like the look of this top-handle bag. It's simple, and it's exactly what I was looking for. But I really can't get over the flimsiness. One exhibition that always amazes me the most when I'm at aquariums is the jellyfish. They are super magical. I can't even describe it. I can just watch them move and be hypnotized. There's just nothing like it. Right behind me is the gigantic "collection" of plastic. They were showing how plastic causes so much waste on the earth and they could just stay like that forever.